A great flower for eating, calendula blossoms are peppery, tangy, and spicy. Beautiful golden color. Sharp taste similar to saffron. Use to add yellow color to dishes. Anti-viral, anti-inflammatory, acne, controls bleeding, menstrual cycle, soothes irritated tissues, rashes, sunburn, radiation pain, abdominal cramps, constipation, anti-tumor, duodenal ulcers. Used on slow-healing wounds (helps grow new healthy cells). Some people may have reactions. Do not take while pregnant. a genus of plants of the family Compositae. They are subshrubs and perennial or annual herbs with rami-form stems and entire leaves. The inflorescences are solitary calathide heads on long flower stalks. The numerous ligulate flowers are yellow, pistillate, and proliferous. The tubular flowers are bisexual but do not bear fruit. The achenes are incurved (annular); the exterior achenes are shaped differently from the middle and interior ones. 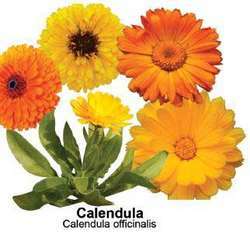 There are more than 20 species of Calendula, distributed primarily from the Mediterranean region to Iran. Species are also found in Central Europe; there are four species in the USSR. They grow along seacoasts, in shrub thickets, and on cliffs. Some species, such as the marigold (Calendula arvensis), grow as weeds. Many varieties of the pot marigold (C. officinalis) have been cultivated for a long time. This species has mainly double yellow and orange flowers of all shades. It is also a medicinal plant, providing a gargle for inflamed mouth infections and an ointment for boils, wounds, and ulcers. The oily extract from the ligulate flowers is used as a food dye. In some countries, dried calathide heads are used as a seasoning for soups and sauces. A germinacao in vitro foi superior com a retirada do tegumento das sementes, obtendo-se 74% de plantulas de calendula (Tabela 1). Whilst there may be a potential role of a topical Calendula cream for vaginal candidiasis, the long term effectiveness, it's effect on recurrent infection, and development of resistance all require further attention. The content of flavonoids was determined as described in the monograph of calendula in the Farmacopeia Brasileira (Farmacopeia Brasileira, 2002), with some modifications. Last year, the company opened the Calendula Garden Childcare Center to the nhbsr. The average length of epidermal cells observed in Calendula officinalis was 94(90-96) m whereas the average length of epidermal cells observed in Silybum eburneum was 57(34-80). We have recommended Calendula cream to most of our patients at one time or another. I'm literally throwing the seed around, not too thickly, and using one kind of seed per area – opium poppies, love–in–themist, cornflowers and calendulas. Nessa perspectiva, apresentam-se resultados de estudo de caso sobre o cultivo organico de Calendula officinalis L.
Extracts from biodynamically grown Calendula flowers help to soothe. Calendula is one of the most known and used medicinal plants, that is widely cultivated both for obtaining extracts used in phytotherapy and ornamental purposes. Herbal sitz bath blends for healing stitches or sore bottoms can be made by mixing comfrey, yarrow, calendula, and lavender.